Kildare’s whistle-stop tour of the divisions will see them alight in Division One next spring after they completed back-to-back promotions with a thrilling one-point win over Clare in Newbridge. Whether they can survive in that high-octane environment is another question but we’ll leave that for another day. This was a flawed, frustrating performance at times from the home side and Clare once again gave them a searching test. If anything the Bannermen may consider themselves unlucky not to have emerged with their own promotion hopes intact having created all of the game’s goal chances on a day when that route to success dried up completely for Kildare. 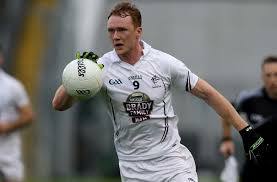 Kildare’s full forward line is starting to resemble A&E at Naas Hospital and with Daniel Flynn the latest pre-match casualty – a hamstring will keep him out for 4 to 6 weeks – it was a boost to see Chris Healy, David Slattery and Ben McCormack all take a full part in the warm-up. Healy and Slattery started with Niall Kelly pushed into corner forward and Fionn Dowling coming in to centre-forward. Neither Healy nor Slattery were able to reprise their goal-scoring exploits from earlier games, although Healy always looked dangerous in the first half. The Lilies have been crying out for leaders and the emergence of more than one has been the most positive aspect of this league campaign. At various points, different players have emerged to drive the team through a sticky period and here Paul Cribbin and Fergal Conway in particular deserve huge credit for attacking the game when it was in the melting pot. The match followed a very similar pattern to the Derry game. It was nip and tuck opening quarter before Kildare opened the throttle and powered into a five point half-time lead despite playing into the wind. Cue another post-break lull that allowed Clare to go ahead in double-quick time before Kildare re-asserted themselves. On this occasion when they did push ahead in the closing minutes there was no calamitous ending although they had a huge reprieve when the otherwise brilliant Eoin Cleary skewed a relatively straight-forward 35 metre free wide of the posts. Clare’s game plan was clear from the start. They pulled thirteen men behind the ball and forced Kildare to go lateral with a lot of their passing, while utilising the pace of Jamie Malone, Cleary and Shane Brennan to punch alarming holes at times in the Kildare defence. They got through for four clear-cut goal chances in the first-half and their failure to take any of those was crucial to the outcome. Within 3 minutes Gary Brennan burst through and was fouled. Five minutes later Mark Donnellan made the first of two point-blank saves to deny Malone. A minute later and Shane Brennan could have goaled and took his point while the same player struck the upright in the 24th minute as Kildare had another huge let-up. Kildare meanwhile began to take a grip on possession, partly because they were allowed to do so. Johnny Byrne was given acres of space on the right hand side and linked up well with Conway at times. Anyone hoping to see an aerial midfield battle between Feely and Clare’s star man Gary Brennan were sorely disappointed as both goalkeepers generally went short. The opening 12 minutes saw both sides kick four points with Feely picking up where he left off against Down with two frees and Cleary doing likewise for Clare. Dowling and Tommy Moolick had earlier notched from play for Kildare but they were struggling to penetrate. A couple of Conway runs on the right could and perhaps should have resulted in goal chances but he got off the mark with a punched point on 13 minutes to edge Kildare ahead. The Lilies now hit their purple patch with Feely scoring two outrageous frees from the left hand sideline as they outscored Clare 0-7 to 0-2 before half time. Niall Kelly was on target twice, Healy found the range as well and Feely was on target with yet another free in a flawless first half from the Athy man. Five points from five frees. Neil Flynn may not return to free-taking duties on his return, you suspect. There was still a kick in Clare though. They’d shown it in Croke Park last April when they overhauled a Kildare lead and they were in front in this game in double quick time. The tone for that period was set in the first minute after the break when Cleary found the range from play. Feely then missed his only kick of the afternoon when he miscued a 40m free in front of the posts and David Tubridy punished that rare lapse with a free at the other end. Then came the goal Clare’s efforts had deserved and yet again a high ball was the undoing of the home side, in common with the only other two goals they have conceded in this campaign. Shane Brennan was on hand on the edge of the square to punch to the net with Donnellan in no man’s land. Keelan Sexton added a point to edge Clare ahead and Kildare were reaching for oxygen. To be fair to Donnellan he stood up to the plate as he has done all season when denying the marauding Brennan a second goal in a one-on-one situation just three minutes after his goal. That would prove crucial. After 10 scoreless second-half minutes Feely popped over two more frees to bring his tally to seven from eight attempts and Kildare seemed to have steadied the ship. But it went aground again in a four minute spell that saw Slattery and Feely black-carded and Clare shoot three quick-fire points to go two ahead (Shane Brennan, Cleary from a free and Malone). Kildare had been outscored 1-6 to 0-2 in 18 minutes after the break. Feely’s dismissal looked like a hammer-blow to Kildare and this is where leaders needed to emerge. They did. Eoin Doyle made some good interceptions to shore up the defence somewhat but wing forwards Conway and Cribbin can take most credit for Kildare emerging from that sticky patch. The Johnstownbridge man found the range with a beautiful point from a narrow angle on the right hand side before substitute Ben McCormack marked his return with a sweetly struck equaliser on 57 minutes. Dowling then edged Kildare ahead with 12 minutes remaining (0-16 to 1-12). Cleary and Cribbin then took centre stage. The Clare corner forward struck a magnificent 62nd minute equaliser from the left wing before a surging run from Conway on the Kildare right eventually set up Cribbin to put Kildare back in front again. Cleary reprised his earlier effort and it looked like Kildare might have to settle for the point that would guarantee them promotion. Cribbin had other ideas though and his determined surge through the Clare defence with the game entering injury time ended fittingly with him pointing the winner. Clare had a late chance to equalise though and you would have bet your house on Cleary to point a free from 35 metres straight in front of the post. Sadly for him he skewed it to the right and Kildare were promoted with a win. Reflecting on the game and the campaign so far, Kildare have come a long way in a short period of time. With the unfortunate exception of the full forward line, the team is settled and you’d imagine number 1 to 12 are nailed down for the Championship. If fit, the inside line is likely to compose McCormack, and the two Flynns. When did Kildare last enter a summer with a predictable first 15? There are few debates about the line-up simply because the players in the jersey have produced a consistency of performance that has been lacking in recent years. Look around the line-up and so many players have upped their performance levels since 2016. Feely, Cribbin, Kelly and Doyle may get a lot of the plaudits but the strength of the team lies in every player performing at a higher level than last year. Whether it be Johnny Byrne’s calm, powerful bursts from wing back, Conway dancing through tackles at wing forward or Ollie Lyons consistently breaking out from defence with lung-busting runs it would be hard to find a player who hasn’t moved things on a notch. You have to in Division Two and by god will they have to in Division One. There are still some nagging doubts. The 10 minute fade-outs that far too easily result in 6 or 7 point turnarounds simply need to be eliminated. For all the good Doyle is doing at no.6, there remains a vulnerability when pacey opposition run at the defence. Then there’s the high ball into our goal. I’d like to see Kildare go to Galway and try to maintain the intensity of their performance. Galway are scoring goals for fun and seem a clear step-up from run of the mill Division Two opposition. With promotion riding on this game for the Tribesmen we won’t get a better challenge ahead of the championship and that includes the League final which is no more than a showpiece. Kildare: Mark Donnellan; Mick O’Grady, David Hyland, Ollie Lyons; Johnny Byrne, Eoin Doyle, Keith Cribbin; Kevin Feely (0-7, 7f), Tommy Moolick (0-1); Fergal Conway (0-1), Fionn Dowling (0-2), Paul Cribbin (0-3); Chris Healy (0-1), David Slattery, Niall Kelly (0-2). Subs: Conor Hartley (for Slattery B/C 51), Ben McCormack (0-1 for Feely B/C 53), Cathal McNally (for Healy 57), Eamon Callaghan (for Kelly 71).